What Is an NRR Rating on Hearing Protection? On April 14, 1987, the Occupational Safety and Health Administration issued a memorandum on using headphones in the workplace, which as of 2014 still stands. 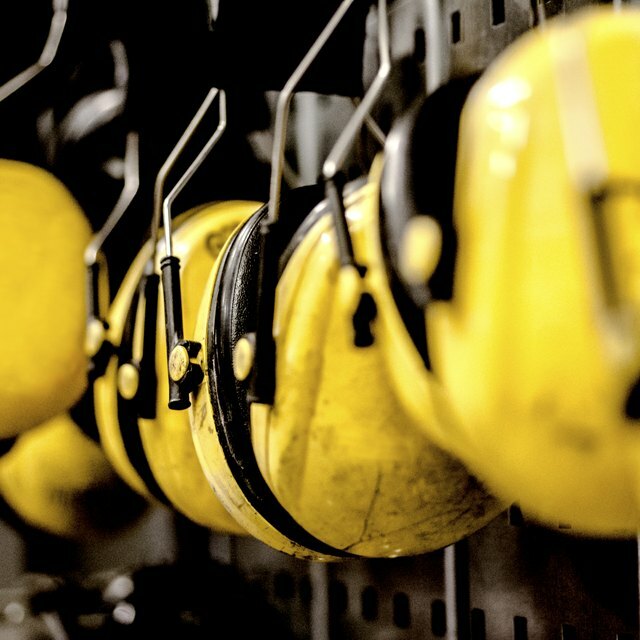 In general, OSHA discourages their use, mainly because excessive sound output can both drown out environmental sounds workers need to hear and threaten hearing. Regulations stated in the memorandum outline compliance directives. OSHA sets legal limits on noise exposure based on an eight-hour workday. The permissible noise exposure limit is 90 sound decibels. The standard also includes a sound exchange rate that says that for every 5-dBA increase in the noise level, you must cut total exposure time in half. As these limits pertain to headphones, OSHA says for headphones that can produce 100 to 103 decibels SPL -- sound pressure level -- setting the volume at more than 50 percent to 75 percent of their rated output will exceed the 90-dBA permissible exposure limit. According to OSHA, the issue isn’t the type of music workers listen to, but rather the sound-pressure energy and length of time workers spend listening to music. As long as occupational noise levels at the business or work site remain within daily noise exposure limits, OSHA generally allows business owners to use their own discretion in deciding whether to allow headphones. However, they suggest business owners remind managers and employees that headphones pose hearing hazards whenever volume levels exceed safe volume thresholds for any “significant length of time,” both on and off the job. Using headphones in noise environments that exceed permissible noise levels violates OSHA regulation 29-CFR. It’s also not permissible to allow employees to wear headphones over required ear protection. The General Duty Clause, Section 5(a)(1) of the OSHA Act of 1970, says that as a business owner, you are legally responsible for maintaining a safe work environment. The penalties for violating OSHA regulations can be costly. Depending on the severity and frequency of offenses, violations can cost your business between $5,000 and $70,000. A strict headphone policy is vital if you decide to allow headphones in the workplace. For example, instead of allowing employees to bring and listen to their own personal headphones, purchase volume-limited headphones that eligible employees can check out and return at the end of the workday. This allows you to maintain control over who uses headphones as well as determine the volume level of the music. Most importantly, however, this ensures compliance with OSHA regulations.